Caution asbestos hazard barrier tape. Non adhesive polythene tape to segregate areas where there are dangers from exposure to asbestos. Size 75mm x 250m. Printed barrier tape. 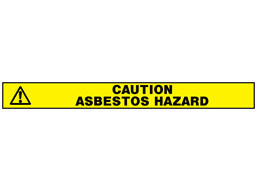 Asbestos hazard. Barricade tape. Non adhesive. Suitable for cordoning off areas. BT1250 Size 75mm x 250m. Material polythene.